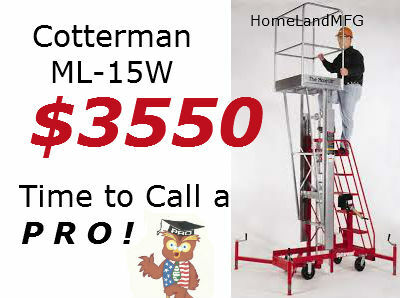 Cotterman Maxi Lifts has several models to choose. 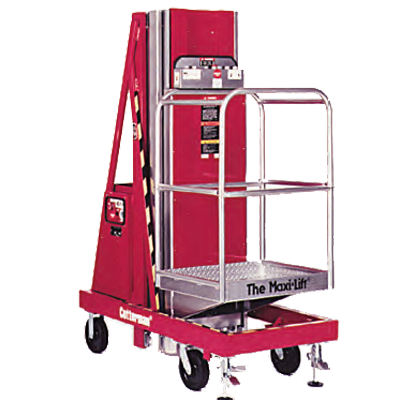 COTTERMAN Maxi-Lifts , (or MAINTENANCE MAN LIFT) is an Outriggerless Push Around MAN LIFT. The Cotterman Maxi-Lifts design are unique in that these units passes all current ANSI standards, plus the proposed changes to ANSI 92.3, which would require greater built-in stability to prevent tip over. The Outriggerless Maxi- Lift accomplished this while holding a 30" width, allowing it to pass through standard doorways. In addition, even though the added weight in the base increases the overall weight, The MLN176BH is still lighter than the 25 Ft. model. Pair this feature with the front and back casters moved closer to one another for a smaller turning radius, and you have a surprisingly easy to maneuver lift . Platform height is seventeen feet, allowing most to work comfortably at 23 feet. Call for Pro Advice! Built-in battery charger and two (2) heavy duty 6V deep cycle marine batteries included. Also this MAN LIFT is supplied with a 110V AC power outlet on the platform. Lockable control center too. Our economical Maxi-Lifts rolls thru a 36" wide doorway. 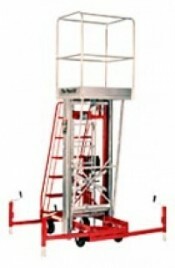 This Manual Winch MAN LIFT is simple to use and maintain. 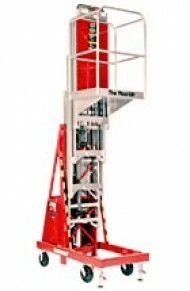 This MAINTENANCE LIFT is quickly elevated to the desired working height with a hand crank winch then the user climbs a ladder to the platform. A built in safety features include a friction brake on the winch and outriggers that can be placed in an X pattern or rectangular. In addition, in case the cable is cut or snaps, a spring loaded mechanical stop engages as soon as tension is released from the cable, preventing a vertical drop.